All natural ingredients combine to make a refreshing peppermint center, rich chocolate coating, and an out of this world candy texture! Using a stand mixer or a hand mixer on low, beat together sugar, milk, honey, coconut oil, and peppermint until combined. Add extra peppermint to taste. Divide dough in half, shape each half into a large disk, wrap with plastic wrap, and refrigerate for 30 minutes. Sprinkle powdered sugar on a clean counter or rolling mat (like you usually would do with flour for sugar cookies). Roll out one of the dough disks to about ¼ - ½ inch thick and cut out 2 inch diameter patties using a circular cookie cutter or something of similar size (I used the top of a small glass). Gather excess dough and repeat process until all of it is used. Repeat for second half of dough. Arrange all patties in a single layer on parchment paper lined baking sheets. Place in freezer for at least 1 hour or overnight. Once patties are cold, melt the chocolate in the microwave on medium power stirring every 30 seconds or on low heat on the stovetop. I remove the chocolate from the heat when there are still some chips left and stir until the rest of the chocolate melts the chips. This helps me avoid overheating the chocolate. Balance patty on a fork and dip into chocolate. Use spatula to help cover the patty in chocolate. Lift patty out of chocolate and use spatula to remove excess chocolate from top and bottom of patty. Gently slide patty off fork onto a parchment paper lined cookie sheet. 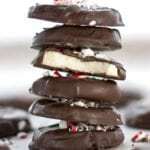 Sprinkle patty with crushed candy cane pieces before chocolate sets. Slide into refrigerator and let chocolate harden. Store patties in refrigerator. Patties are best served chilled.